Shelly-Ann Fraser-Pryce, OD is a Jamaican track and field sprinter. 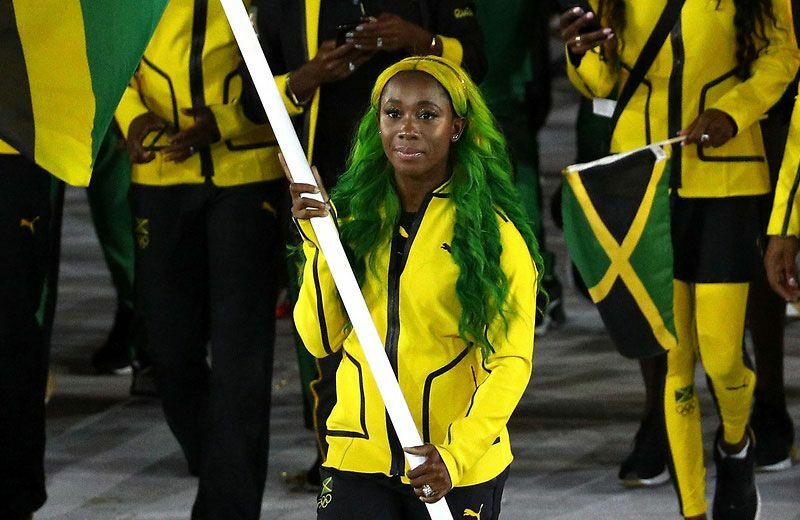 Born in Kingston, Jamaica, Fraser-Pryce ascended to prominence in the 2008 Olympic Games when at 21 years old, the relatively unknown athlete became the first Caribbean woman to win 100m gold at the Olympics. In 2012, she successfully defended her 100m title, becoming the third woman to win two consecutive 100m events at the Olympics. Fraser-Pryce won the 100m gold medal in the 2009 IAAF World Championships, becoming the second female sprinter to hold both World and Olympic 100 m titles simultaneously (after Gail Devers). After winning the 2015 World title in 100m, she is the only female to be crowned world champion over 100m three times (2009, 2013, 2015). She is also the only female athlete to hold both titles on two separate occasions (the 2008 Olympic and 2009 World titles, and the 2012 Olympic and 2013 World titles). In 2013 she became the first female sprinter to win gold medals in the 100m, 200m and 4 × 100 m in a single world championship. Fraser-Pryce was the first woman to own IAAF world titles at 60m, 100m, 200m and 4 × 100 m, and is the only woman ever to hold them all simultaneously.